A month ago Laurens Holst announced that he had started to work on a VGM music file player for MSX. VGM (Video Game Music) is a sound logging format for many machines and sound chips. It logs the commands sent to the sound chips, resulting in files much smaller than mp3s, and more importantly, files that can be played by the sound chips on our MSX computers. After a month of hard work, VGMPlay for MSX 1.0 has been released. All sound chips available for MSX are supported. You can get it from the downloads page on the project site. Also check the videos on Youtube. For more information go to the project page. Some great sites to find VGM files are vgmrips.net and SMSPower. Excellent work ! Just tested in blueMSX with TurboR, SFG-05 unit and a great Dragon Spirit (Sharp X68000) stereo music !!! The vgm files with FM from smspower says that is not a VGM file. I've connected the Psoniq too. guantxip: You have to extract them with gzip to get the uncompressed vgm files. Sometimes even when they have the .vgm extension, they’re still compressed. Mmh, you may need to submit a request on smspower for that… or rip it yourself . It sounds like it doesn't use my SCC (Salamander cartigde with a switch) in port 2 anymore after the first song, no matter if its the same song twice, if the first song uses the SCC, or not. Something I do wrong? Hi diederick76, I just tried playing some Nemesis 3 VGMs on my King’s Valley II cartridge with switch in slot 2, and it works on both my turboR and CX5MII. Could you give me some more information about your set-up, like which MSX you are using, what’s in slot 1, which music are you trying, etc.? If you can replicate your configuration in an emulator and reproduce the issue that would be even better. Hi Grauw, I'm using a Philips VG 8235 with a Sunrise IDE SD-card cartridge in port 1. The SD card contains Vgsplay and the songs on the same FAT12-partition. 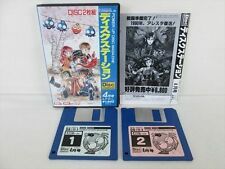 I'm using MSX-DOS 2. The songs I tried are from Nemesis (1) and Salamander, both from collections downloaded from one of the sites you mentioned. I'm at work now, but I will recreate this setup on OpenMSX this evening and find out if it works. There are two songs of Sonyc OPL4 that appears a message of Not enough memory. (songs 8 & 9). My computer is ST with 512k and I added an external 4m card, but with the same result. My moonsound I think has memory enough because I never have problems to hear moonblaster wave files. guantxip: The 1.0 version does not support secondary memory mappers yet, so it uses just the 512K main RAM. But I added support for it yesterday, so it’ll be included in the next point release. If you want it right now you can get the latest source and make a build yourself (very easy: run "make" on OS X / Linux, for Windows see the readme). I'll wait to the next release. I have tested with all chips except sfg-05 because I'm not owner. And it's a great program, congratulations!. Plays SCC music nicely on my MSX2+ modded NMS8255 with CF-IDE & Playsoniq, thanks! Grauw, have you been able to load the Hexion musics? I did a fast test with blueMSX with no success. The player loads the files (so they have been uncompressed correctly), but no sound. Maybe I should try with real HW? :-? BTW, these musics need an OKI chip for drum samples originally, is this supplied by Music Module now or will they sound without drums? Nice to see so many people listening to VGM music . guantxip: I’ve included a development build with secondary mapper support in the above vgm collections. Also it skips 9x commands now, in stead of aborting. And if you stumble upon an affordable SFG-01/05, I really recommend picking one up, there’s some great music for it ;). Jupp3: I’ve added those to the ideas list :). For now to make a playlist I recommend to create a little batch file. 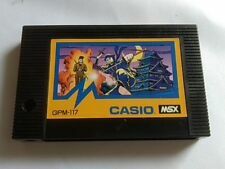 Pac: Hexion loads and plays fine in openMSX here, although the OKI chip is used quite extensively so you’ll miss some parts of the music. In the future I’d like to emulate several of the PCM chips on Music Module or MoonSound, however for VGMPlay version 1.0 I focused on the chips straightforwardly supported by MSX. Can't reproduce the behaviour mentioned earlier with openMSX. I made a copy of the SD card and put that in openMSX (carta) en put an scc in cartb. openMSX now happily plays all the Salamander songs. Switching the cartrigdes on the real MSX makes the problem go away though. I can play the songs just as on openMSX. Vgmplay keeps using the SCC. But oddly, when I switch them back, I can only hear the SCC with the first song. Prioritise this issue as you see fit. I have a work-around as mentioned. If/when you need help debugging this, just tell me what to do. Hi diederick, thanks for testing. Too bad it wasn’t reproducible on the emulator, that would’ve certainly made things easier . I’ll give it a try next week on my NMS8245 with Sunrise CF-IDE and King’s Valley II. Thanks Grauw, all songs of Sonyc opl4 works fine. For OPM, you need SFG-01 or SFG-05. Okay, thanks, this one is new to me Sounds nice though. OPM or the YM2151 is the FM synth you can find in the Yamaha SFG-01 and SFG-05 indeed, which were also built into the Yamaha CX5M series of MSX machines. Okay, and can it be compared with the fm-pac ? For instance, can it be used with, let's say, Aleste to hear the fm-pac music or where there games especially made for the SFG-0x soundchip ? - SFG = FM sound Synthesizer built around the YM2151 or YM2164 sound chip. These IC's have 4 operators and are for example used in the cheaper Yamaha DX series (e.g. the DX-9, FB-01), several arcade games and the Korg DS-8 and 707. This unit includes a D/A converter (YM3012), so 8 audio tone signals can be obtained at the right and left channels. It has also a YM2148 chip with MIDI function and keyboard scan function. Stereo sound with SFG ! No any specific game was developed on MSX with SFG music, as it was mainly used on musical MSX computers (the Yamaha CX5M/7M serie). Hi, back from vacation . The YM2151 OPM is more or less comparable to the OPL3 or OPL4 FM (though, quite different! 8 4-op channels, a single waveform, and different FM algorithms). I really love the sound. There is a lot of good music for it from arcade games and the Sharp X68000 and Sharp X1 Turbo (Japanese home computers). If you don’t have a real one, it’s emulated by openMSX and blueMSX. congratulations for your fantastic job. I'm gonna triing to use it on MultiMente to let the gui start the VGM automatically. I downloaded the nice package full of vgm. I only wish to know a scheme of WHAT can i play WITH. Folders with OPL,OPL2, OPL3, OPL4, OPM name contains vgm I can play with ?? Folders with OPLL name contains vgm I can play with FM PAC? Are you thinking about a user GUI to add ? Are you thinking about a folder browsing feature to list all VGM inside a folder, displaying also the chiptune needed for each .vgm? See the README on the website which sound chip plays what. FM (OPLL) can be played with FM-PAC. OPL can be played with both Music Module and MoonSound. OPL2-4 can be played with MoonSound. I’m thinking about a GUI but it’s not the first priority, for now I indeed recommend to use Multi Mente (configuration instructions in the README). Currently I’m working on gunzip support, also I added a few other features recently like high-resolution timer support (4000Hz) on MSX turboR. Also recently I recorded a VGM pack of Xak, I’ll post it here once it is approved on vgmrips.net. Sorry if it is a dumb question, but would it be feasible to make a DOS 1.x compatible version of VGMPLAY? Yes, I supported DOS 2 first because it was a bit easier. It’s on the to-do list. My Xak: The Art of Visual Stage VGM pack is now available on vgmrips.net. Any idea about the next release? I wanted to wait until I complete gunzip support, but there’s been a couple of other changes in the mean while so maybe I’ll do an intermediate release in the near future. @ Grauw: Nice. Where did you get the song titles from? I think I took them from the ripped data of the SNES version when I made my video of the soundtrack, and your versions show some differences with those. I translated the titles from the OST on EGG (which is the same as the older OST with a few additions). Also cross checked with amongst others your video and the thesaurus :). Just noticed I made a typo in the Uneasiness track name though, hrm. Also finished Xak for the first time while I was at it :). Also finished Xak for the first time while I was at it . I bet you didn't regret that. You might want to consider re-recording the "Victory" theme. It has a 'percussion hit' at the beginning which is not supposed to be there. Possibly some noise command still stuck in the buffer. I’ll check if I can get it to play without. One of the Xak songs was featured on the Pixelated Audio Podcast, at 30:24! Really nice :). I get totally different stuff (different issue?). Is it a problem with my browser? The link works fine here, but the time was different: from 31:54. They chose a good track but Xak has many of those. @Grauw: next up finishing Xak 2 and Tower of Gazzel? Almost makes me want to play them again too... But afraid I want to translate it then. Hahaha, well, I wouldn’t complain . The song starts at 31:54, but they start talking about it a little earlier. I do think something strange was going on, this morning I quickly checked @ work and indeed there seemed something wrong, but now it’s ok for me. Xak 2 and Gazzel, I do want to play those games as well, but it was quite a bit of work to rip Xak so I can’t say when I would do the sequels. Secretly I’m hoping someone else feels inspired to rip them . While I was ripping the Xak VGM I shared it on the #vgmrips channel, and bmos (one of the hosts of the show) really enjoyed the soundtrack a lot, so it’s nice that he featured it on his podcast! Quite a bit of nice background information in it too. It's probably something with my browser. I still get talk about Pokemon Crystal on the Game Boy and no Xak music at all. How about the MP3 download and play it in something else than your browser? Ok, a bit late but… the game’s sound test doesn’t reset the drum key-ons when selecting the next track, so the VGM splitting and trimming faithfully reproduced that last drum register setting at the start of every song. I just submitted a pack update, should be live somewhere in the coming weeks, but for the time being you can find the updated pack here. Ehm... Could the Micro Music TSR be helpful?